Robert Dill Pickle, AKA Bob Dylan is a moron who sings like a drunk fish imitating Regis Philbin. He was invented back in the day by two Danish immigrants and often came back to Daneland to sell crap to local villagers in exchange for candy and a new piece of Afro Gum. He is often confused with Bob Marley, but they surely are not at all the same and you can rest assured that is a fact. Dylan is a fish and was a fish in his former life. Bob Dylan liked to sing, and smelled like Nirvana. He also ate taco seasoning for breakfast each day, right after Regis Philbin shut up. He also did LSD, which explains how he sang so oddly like he did, almost like mumbling. He is now fascinated by religion, yet is an atheist. He also gave up singing. Yo Chizzle, whuddup with dat? I got no ideaz. Meh. 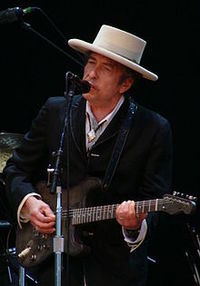 Bob Dylan was inducted into the Drunk Mumbling Hall of Fame for his single "Like a Rolling Stone" which Green Day covered, but while sober for some odd reason. Yeah, he had a funny voice, but he made money like wildfire. Just like Elvis before him. But Dylan didn't have to wiggle his hips to make it. Meh. I give up. I'm tangled up in blue. This page was last edited on 8 Serpeniver 2013, at 09:51.